SPW035660 SCOTLAND (1931). Carntyne Housing Estate and Haghill, Glasgow. An oblique aerial photograph taken facing east. Pennawd [SPW035660] Carntyne Housing Estate and Haghill, Glasgow. An oblique aerial photograph taken facing east. Kennyhill School : A horse and carriage at the entrance to Kennyhill Special School in 1916. Kennyhill House was acquired by the Glasgow School Board c 1911 and opened in 1916 as Glasgow's second special needs school. The original villa was extended forming a courtyard behind the row of buildings pictured here. The old Kennyhill estate covered ground now occupied by Alexandra Park with this villa at its southern edge, facing what is now Cumbernauld Road. At the beginning of the 21st century Kennyhill is a secondary school for pupils with moderate learning difficulties. Carntyne Primary School. Being demolished 2017. When the Edinburgh Road was first built it had huge tall lamp standards which burnt sodium orange coloured lights which were quite spectacular, as compared with the GAS lamps that were along Alexandra Parade when I was a small child. Alexandra Parade was to the west of Edinburgh Road - a nice long straight road mostly. Tennis courts (4) and the changing pavilion - the white building which can be seen to the left. Little pier, wooden slats with small space between the wood - allowing fishing for minnoes. Several football pitches with horrible clinker/gravel topping. 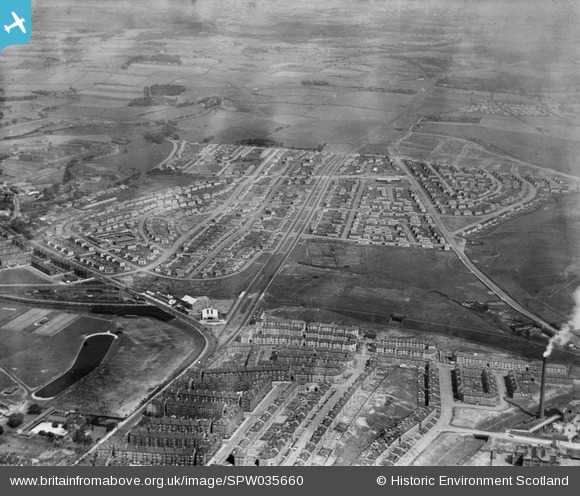 Railway line to Springburn (north) and then to south of the city. Large shallow pond where the model yachts were sailed. In the winter it froze over and skating took place. At the west-end there was a little pier and you could fish for minnoes. This is the building where the model yachts were kept.